One of the perks of living in a fixer upper is all of the messy and fun things you can do inside your home before making it nice. For instance, giving your son or husband a haircut in the living room. Super convenient! Thankfully, we have had the sunroom and the bedrooms somewhat livable during this time and haven’t spent too much time in the living room. However, we have had to walk through it to access these livable places. Much like having a garage in the middle of your house-if you can imagine that. So this image has been my inspiration from the very beginning. 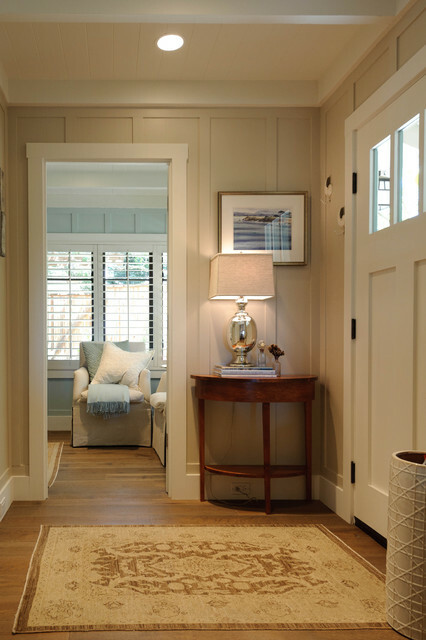 I did my research on the website http://www.houzz.com and discovered the EXACT paint colors on the wall and trim. I knew that if I loved them here, I would love them in our Dirty Diamond. I didn’t want to experiment and try my own colors. Especially, since we are on a tight budget. The paint is Sherwin Williams – wall, Accessible Beige and trim, Alabaster. A short video of the steps we will take in the installing of sheet rock and board and batten look. After removing the dark paneling and discovering no insulation or sheet rock, Jonathan went to work installing new insulation. This particular wall is where the television will be and our master bedroom is on the opposite side which means no sound barrier what-so-ever. The insulation will help muffle the noise. Because of the board and batten look we were going for, we had the idea to install the sheet rock vertically. Typically, sheet rock is installed horizontally; one on top of another. Our grand idea was to install vertically and between the sheet rock seams place our boards, as well as on every stud. We were crossing our fingers that this plan would work. What a difference just putting white sheet rock did for the room. The living room was instantly brighter and cleaner looking. Now it was onto buying the wooden strips for our board and batten look. However, when Jonathan priced it out— WOWZA!! It would cost us over $500 just to buy the strips because we needed 72 strips for the living room and entry way. We were trying to keep the cost low. Once again, we try to think outside the box on ways we can save money. Jonathan went to our local hardware store and purchased 1/4 inch sanded plywood, it cost us around $20 a sheet. We bought 4. Around $80 is all we spent. Now it was time to turn them into strips. So we got to work setting Jonathan’s table saw at 2 inches and ripping boards–72 of them. It really didn’t take too long and was worth the savings in my opinion. Jonathan had to rebuild the window frame to look uniform with the look of the room. He also had to move the doorway over between the kitchen and the living room due to the size of our refrigerator. I certainly did’t know he knew how to do this! He amazes me every day!! The thing you do have to consider when hanging the sheet rock vertically is that on every piece of sheet rock there is a slight dip along the length of the sheet rock edge. Normally, this is where people will tape and bed the seam together. Our two inch strips didn’t cover the entire dip and so Jonathan puttied it to fill it in and sanded it down to make the wall level and smooth. Then, Jonathan nailed the boards on every seam and where ever a stud was placed behind the sheet rock. I’m seeing it come together and that our plan on installing the sheet rock vertically has really paid off and is achieving the look we are going for. I’m pretty much GIDDY! Oh and do you see my new fan that replaced the 80’s version? I wasn’t sure about this particular style ( a little modern for me), but when it is on the clearance rack for $30, you take and you don’t second guess. I’m now in love with it!! And “NO” that fluorescent light on the mantle is not our mood lighting. It still is pretty dark in this room, especially at night with the one light from the fan. SO the fluorescent helps…for now. We’re getting closer to the end!! We actually decorated our Christmas tree in the living room last night! So you know that there is a HAPPY ending to this LIVING ROOM story. Thanks Sam!! I appreciate your comments!! I am living watching the transformation! I wish we had documented more when we did our little farm house. Of course it’s never done! 😉 Maybe I will for our next project! BTW I live board and batten too! We just did it in our bathroom.